Heroku PaaS Introduces New Infrastructure With Some Change in Their Basic Uni Named Dynos and Pricing. The Free Usage Tier Remains Unchanged. In official release, Heroku wrote – “Today, we™re introducing a suite of new dynos. These dynos introduce new capabilities and price points and reduce the cost of scaling businesses on Heroku. These new dynos enter beta today.” Heroku was established by James Lindenbaum, Adam Wiggins and Orion Henry in the year 2007. In 2010; Heroku was acquired by SalesForce. The Free Usage Tier of Heroku attracted the developers since then. Until RedHat OpenShift emerged, Heroku was the undeclared Queen among the small developers. Heroku PaaS Introduces New Infrastructure : What is New? 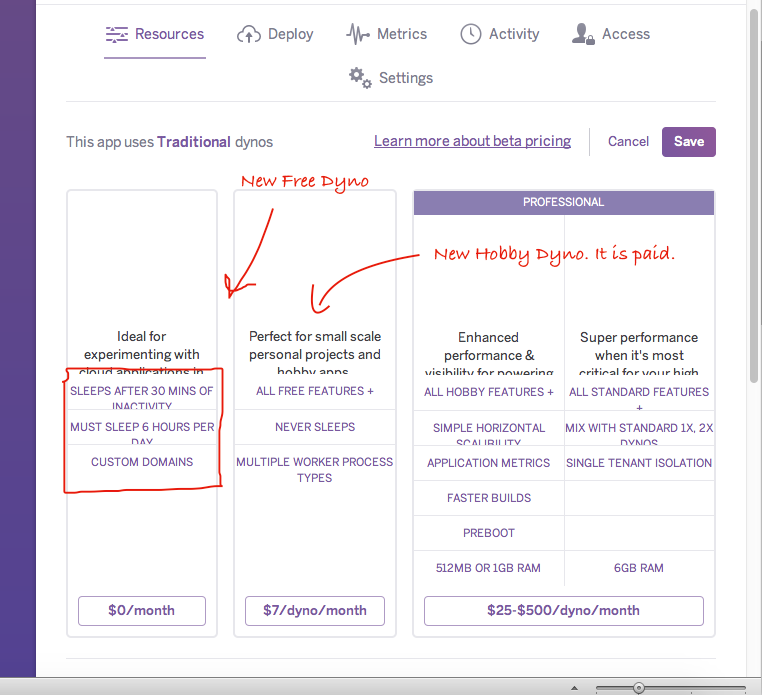 Officially Heroku wrote – “Free services have, and will continue to be, a key part of Heroku™s offering.” The type of new free dyno has been new addition apart from the cost effective “hobby dynos” ($7/month). This new free dyno has the feature like the paid dynos – when and how much it would sleep when not used. The free dyno added more features, and is more accessible. Apps using free dynos can have custom domains like before. Heroku possibly wanted to decrease their usage of computing power as well as increase some revenue. Will Heroku PaaS Can Run in the Famous Way it Was? Clearly, OpenShift PaaS is far better option as PaaS now. Additionally Digital Ocean gives an IaaS instance at $5.00 per month – that much is enough for hobby works. Frankly, no one wants complexity in the work and PaaS still is the alternative choice to IaaS. Heroic recently added lot of features including integration with Github, Dropbox and all the needed commands are displayed on the web UI. With the advent of OpenShift we have forgotten Heroku, creating web directory in Heroku is of historical importance now. Heroic honestly did a lot for the developers, whether they can rule the PaaS or not, that is honestly not much of importance from the point of history in development. Obviously, Free Heroku can be used for creation of Mail Server like stuffs which is suitable for 6 sleeps per day. Whatever offered for free of cost is a bonus. This Article Has Been Shared 5318 Times! Cite this article as: Abhishek Ghosh, "Heroku PaaS Introduces New Infrastructure," in The Customize Windows, May 14, 2015, April 21, 2019, https://thecustomizewindows.com/2015/05/heroku-paas-introduces-new-infrastructure/.